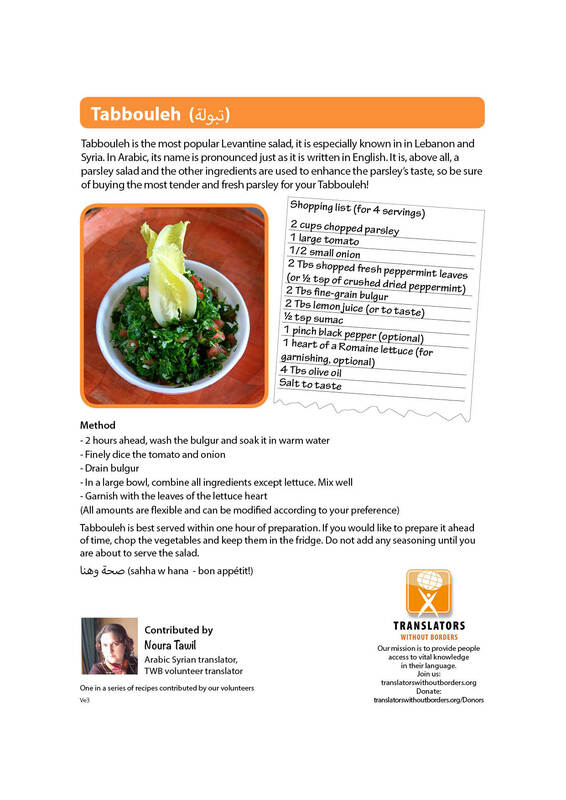 Tabbouleh is the most popular Levantine salad, it is especially known in Lebanon and Syria. In Arabic, its name is pronounced just as it is written in English. It is, above all, a parsley salad and the other ingredients are used to enhance the parsley’s taste, so be sure of buying the most tender and fresh parsley for your Tabbouleh! 2 hours ahead, wash the bulgur and soak it in warm water. In a large bowl, combine all ingredients except lettuce. Mix well. Garnish with the leaves of the lettuce heart. Arabic Syrian translator and TWB volunteer translator.